Sliders don't always have to be savory. 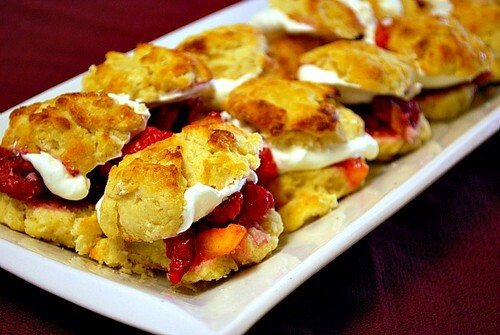 A sweet version is to make mini shortcakes and filling them with fresh fruit. For peach melba, peaches and raspberries come together to create not only a colorful presentation but a deliciously sweet and seasonal spin. I wouldn't recommend using frozen fruit, especially when you can get them fresh during the summer. But if need be and you're craving these flavors when you don't have fresh on hand, you could use frozen. If you go that route, you'll need to drain the fruit before assembling because of the additional moisture and liquid as the fruit thaws. Cut the butter into small cubes and chill them in the freezer for 15 minutes or longer. Meanwhile, in a large bowl, vigorously whisk together the flour, sugar, salt, and baking powder for the biscuits. Remove the butter from the freezer and cut it into the flour mixture with a fork or a pastry cutter, or pulse in a food processor until the largest pieces of butter are the size of peas. Whisk together the cream, egg, and vanilla in a separate small bowl. In the large bowl of the flour mixture, make a well in the center and pour the cream/egg mixture into the center of it. Slowly mix the cream/egg mixture into the flour with a fork until the dough is evenly moistened and has a shaggy look or texture. Knead the dough with your hands for 1 minute and gather it up to create a ball. Lightly flour a smooth surface. Turn the dough out onto the surface and pat or roll it out with a rolling pin until it is between 1/4 and 1/2-inch thick. Dip a 1 - 1 1/2 diameter biscuit cutter or small juice glass in flour and cut out round biscuit shapes from the dough. (The flour helps to prevent the dough from sticking to the biscuit cutter.) Place rounds on a baking sheet and space about 1 1/2 to 2 inches apart from each other. Place in the refrigerator and chill for 10 minutes before baking. Preheat oven to 425°F. Remove the biscuits from the refrigerator and bake biscuits on middle rack for 12 minutes, or until risen and lightly browned. Remove from oven and let cool. Place the diced peaches and halved raspberries in a bowl and sprinkle sugar over them. Gently mix so that the sugar coats most of the fruit. Let sit until the sugar dissolves and the fruit releases their moisture. To make the whipped cream, place the cold cream into the chilled mixing bowl. Using a hand mixer, whip the cream until it forms soft peaks. Sprinkle the sugar and vanilla over the cream. Continue to whip until it is thick and holds its shape. Cover with plastic wrap and keep chilled until it's time to assemble the mini shortcakes. When the biscuits have cooled to room temperature, gently break them apart, separating the tops from the bottoms. Place a tablespoon of the fruit mixture on each bottom, and place a dollop of whipped cream on top of the fruit. Then place the top biscuit piece on top of the whipped cream and enjoy! I love the idea of doing a non-strawberry shortcake and turning it into a slider, because let's face it, everything is cuter when it's mini. I was actually just thinking the other day that I wanted to do a fall shortcake with caramel apples. I love the idea of turning it into a slider. These look deliciou, my husband would love them love them, I am not much of a baker but I am going to give these a try, thanks.